Alia Bhatt, Vicky Kaushal and Soni Razdaan in a still from 'Raazi'. Patriotism is one of the most exploited genres of our Hindi film industry but Raazi is undoubtedly by far the best one in this space. Based on the book ‘Calling Sehmat’, Raazi is an extremely entertaining film in the recent times. Director Meghna Gulzar, who has a knack of telling real life stories in an unconventional way, Raazi truly emerges as a sure shot winner. It is gripping and high on emotions. 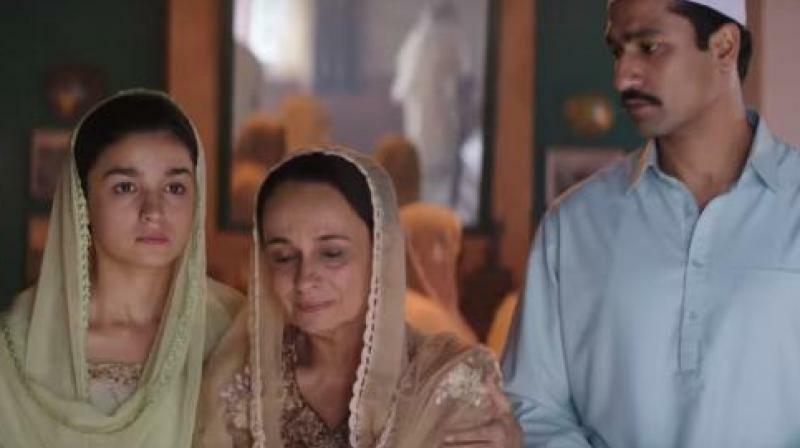 In order to save his country from an untimely war with Pakistan in 1971, Hidayat Khan (Rajit Kapur), who is soon dying of lung tumor instructs her only daughter Sehmat (Alia Bhatt) to marry Iqbal Syed (Vicky Kaushal) and move to Pakistan. He plants her as a spy and Sehmat agrees to do so. Hidayat appoints Khalid Mir (Jaideep Ahlawat), a merciless and tough mentor to train her. Teji (Soni Razdan), her mother supports this decision and prepares Sehmat for this task. Sehmat marries Iqbal and hereon starts her journey which changes her life like never before. Will she able to save her nation from the war? Raazi answers to this mystery! Meghna has a clear vision as a filmmaker. She manages to strike an adequate balance between realism and thrill. Her screenplay along with Bhavna Iyer is so good that the film will transport you back in 1971 for those 140 minutes. Her knack for sketching her characters is very impressive. She assures you that no one in the narrative let you down. There are hardly any loopholes in the film except for Sehmat being such a smooth spy in Pakistan especially at her house, however, it is backed by a seat edge thrilling story which is highly convincing, so it can be easily neglected. With not a single dull moment despite of slow pace in the first half, Raazi won’t bore you even for a single second. It was a matter of worry since Meghna penned the script in absence of Vishal Bhardwaj unlike the last time in Talwar but she clearly passes the litmus test and outshines as a story teller. It has an exciting stimulation of wanting to know what’s next store for you. Alia Bhatt, the finest actress of the current generation. Her innocence, naturalistic portrayal and breakdown is beyond imagination. She impresses with each scene, rather with each shot. Wonder, how she wears Sehmat’s skin with so much ease. Alia is full of surprises and with each film she plays her different card and warns for her next film which would be even better than her previous. Her act in Raazi is more of less at par with Udta Punjab which is considered to be her career’s best. Vicky Kaushal as Iqbal Syed speaks volumes, such a praiseworthy performance. He is simply the next superstar. He emits abundance of talent in every moment. Rajit Kapur moves as an ageing father in his brief role. Shishir Sharma, Soni Razdan are too good! The one who stands out along with the primary star cast is Jaideep Ahlawat. He is a silent winner in the film. He is brilliant as Khalid Mir. It might change his game in the industry. Rest of the characters also draw attention whenever they are on screen. Overall, Raazi celebrates the spy-thriller genre and proves good content prevails. Perhaps, a lot of aspects make this film unapologetically finest of 2018 so far.